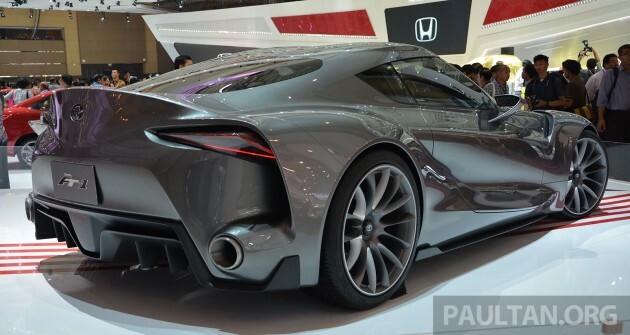 It wasn’t a world debut, but the Toyota FT-1 Concept was THE stunner of the 2014 Indonesia International Motor Show (IIMS), which we just got home from. Sitting at the welcoming edge of Toyota’s stand at JI Expo, this was the car everyone wanted a selfie with. With good reason, because the front-engined, rear-driven FT-1 is a stunning blend of dramatic curves and classic sports car proportions. Toyota’s preview of a future halo model made its debut at Detroit 2014 earlier this year, but that car was in red. This unit, in gorgeous graphite grey, was first shown at the 2014 Pebble Beach car show in August, so it’s hot off the press. Managing to secure such a display is quite an impressive feat for the local Indonesian arm, but I guess that when you control over half of what could grow to be one of the world’s biggest markets (Toyota and Daihatsu combined), you have reasonable clout. The driver faces an F1-inspired steering wheel with gear indicator and an engine start button. Flanking it are shift paddles, and just above it sits a colour head-up display and a delta-shaped display zone. There are also two deep bucket seats (lined with brown natural-grain leather for this grey car) and a swoopy centre console, but we can’t show you all of that – the car was on a raised platform that was out of bounds. One can already drive the Toyota FT-1 and its racing sister in Gran Turismo 6, but let’s all pray for the real thing. New Supra? Yes, please! Stunning this car look like it can fly. Proton macai especially Peyno will claim that Toyota is copying Dodge Viper. Now Proton “smokers” who believe the Iriz can smoke chicken wings smoke Christmas turkey they all keep silent. Real Same L0rrr has no problem with kampung/city people, but on cars with poor build quality and money begging car maker. Wow…the beast…perfect for Batman mobile. Put a few more wings & it’s ready for next Batman movie! aah , any topic which is NOT axia related is always refreashing! jus how many percent of this is will actually make it to production i wonder?? Hopefully Toyota can finally transform this concept into the production reality but still staying true to the concept car design details. The Lexus RC-F was a big disappointment styling-wise, which deviated too much from the Lexus RC concept styling. 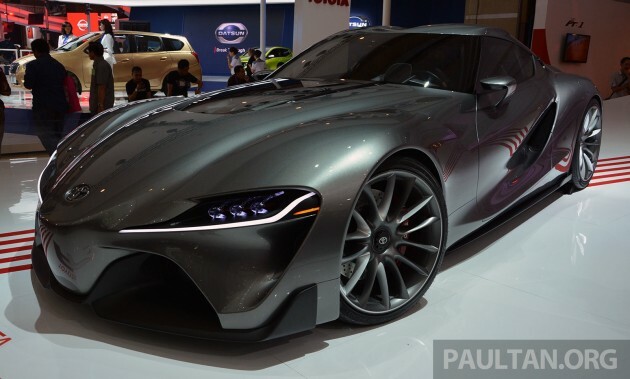 But looking at this Toyota FT-1, it looks like it’s almost production-ready. The world needs more supercars from Japan Inc , other than the GT-R.. When will Proton rebadge this? Do you mean 2 hundred percent profit margin? or 2 litre NA with no turbo at all? BTW, to me this car is ugly. wonder what will it like when the real car come out..
modify the front a bit but keep the rear!! It appears we now know where all the designers from Toyota have disappeared to….. THIS PROJECT! Leaving the other models (Camry especially) to Transformers fans. Hopefully the same could be said about the upcoming Supra,…. Altho the LFA is uglier than the concept in pursuit of performance…. I fear the looks of the ft-1 may be toned down to cut costs or to improve performance to chase the inevitable arrival of the r36 gt-r…..